With little experience, kids new to riding with gears quickly figure out how to find "easier" and "harder" gears. Adults can easily select these, too, but describing "bigger" and "smaller" gears or "shift up" and "shift down" can be a bit of a confusing and contradictory process, no matter your age. The main concept in speaking the language of gears is the difference between a physical gear (i.e. chainring or cog) and the gear ratio. The physical gears are what you shift to determine the gear ratio you pedal against. You can shift the front or rear derailleur to select a different chainring or cog. These shifts change the gear ratio. The trick is that moving to a bigger chainring makes a bigger gear ratio (a "harder" gear), while shifting to a bigger cog makes the opposite, a smaller gear ratio (an "easier" gear). This is where the confusion arises. So let's lay out the common terms used in describing the range of gears. Chainring. The large gear in front attached to the crankset; either 1, 2, 3 different chainrings depending on the style of bike. Also referred to as the front (e.g. "shift up in front") or something related to the front derailleur; or a ring (i.e. big ring or small ring). Cog. The smaller series of gears in back; ranges from 1 on a single-speed bike up to 11 or 12 on new road bikes. Also referred to as the back or rear (e.g. "shift up in back"); sprocket; cassette; or cluster. Teeth/tooth. The number of teeth on a gear. Commonly 50, 52, or 53 teeth are on the big chainring in front with a road bike, and 11 or 12 teeth are on the smallest cog. Often abbreviated as "T" as in 53T chainring, but also often omitted to call a chainring simply a 53. Chainring combos are usually referred to as 53/39 (big ring, slash small ring), and cassette series are usually referred to as a range from the smallest to bigger cog, as in 12-25. Gear combination. The number of teeth of the chainring and cog that is being used. It's usually expressed as 53×12 if the chain is resting on the 53T chainring and the 12T cog. Gear ratio. The mathematical ratio that compares the combination of the front and rear gears: Gear ratio = Chainring ÷ Cog. For example, if the chain is running on a 53T chainring and a 12T cog, the gear ratio = 53 ÷ 12 = 4.4167. Note: the nomenclature for gear combination makes it look like you multiply the numbers (e.g., 53x12), but in reality you divide them to figure gear ratio. Gear development. Also commonly referred to as roll out, this is the distance the bike travels with one full revolution of the pedals. It is the product of the gear ratio (chainring ÷ cog) and the circumference of the rear wheel (wheel diameter × π). Therefore gear development = (chainring ÷ cog) × (wheel diameter × π). For example, riding in a 53x12 with a 700/23 rear wheel wheel results in (53 ÷ 12) × (26.3 inches × π) = 4.4167 × 82.6 inches = 364.8 inches, or 30 feet 4.8 inches. The reason for calculating gear development is to account for different wheel sizes that bikes use, such as the variety of common wheel sizes on mountain bikes. Gear inches. Still used to refer to gear sizing in track racing, this concept is a throwback to the days of the ordinary bicycle and indicates the size of wheel that would be necessary on an ordinary bicycle to match the gear development of a modern bike. That means, instead of using a combination of gears like on a modern bike, what size wheel would be required on an ordinary bicycle to cover the same distance with one revolution of the pedals. It is calculated as: gear inches = (chainring ÷ cog) × wheel diameter. For example, (53 ÷ 12) × 26.3 inches = 116.2 or just short of 10 feet. Since you'd need legs more than 5 feet long to pedal an ordinary bike this big, you can see why gears were invented! To summarize the key parts of those terms, the chainring and cog combination determines the gear ratio (gear ratio = chainring ÷ cog). Because people use similar wheel and tire sizes, gear development is not often used when taking about gears, and gear inches are usually reserved for track racing. So why all the terms, definitions, and math? As I pointed out earlier, we still haven't gotten to what it means when someone says, "Shift up!" or "Use a smaller gear." So let's get to the point. If someone says smaller or bigger, take this to mean a smaller or bigger gear ratio; unless chainring or cog is specifically stated, bigger and smaller gears refer to bigger or smaller gear ratios. That means that a bigger gear means a harder gear to push and a smaller gear is an easier gear to push. Keeping on this same theme, shifting up means shifting to a bigger gear ratio—a harder gear to push—and shifting down means a smaller gear ratio—an easier gear. The trick is to pay attention for references to the cogs, though. If someone says, "Shift your cassette up," this does not mean the same as, "Shift up." Instead "Shift your cassette up," refers to going to a bigger cog in back, which is actually shifting down to an easier gear. So why don't cyclists use the terms easier and harder to describe gears? Who knows!? They just don't, and it's terminology that usually is reserved for beginners, so as you get used to the phrases and the meaning becomes clear, it's no longer a problem. But to give some examples of the many variations, here are a list of terms and phrases that refer to bigger and smaller gears. 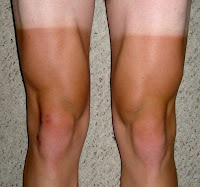 Let's face it, somehow bike racers have a skewed vision of vanity. 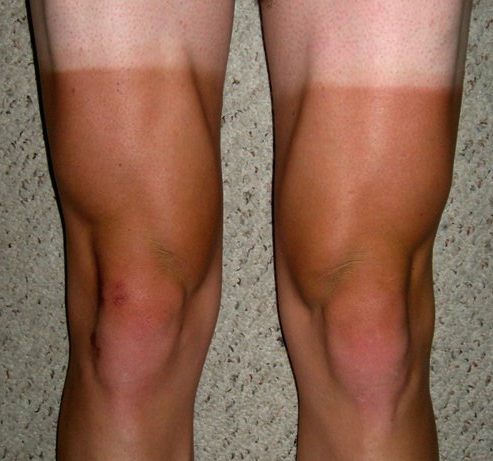 When was the last time a cyclist showed you his "great" tan lines? If you know many bike racers, it probably hasn't been long at all. But we all know that too much sun isn't good for you. 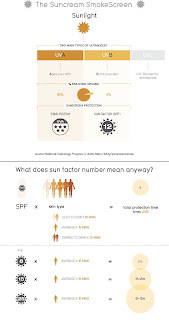 To help keep all the time in the sun in perspective, there's a great sunscreen info graphic on InformationIsBeautiful.net that has a very good description of sunscreen—what is protects against, how much to use, how long its protection lasts—and the types and dangers of skin cancer. 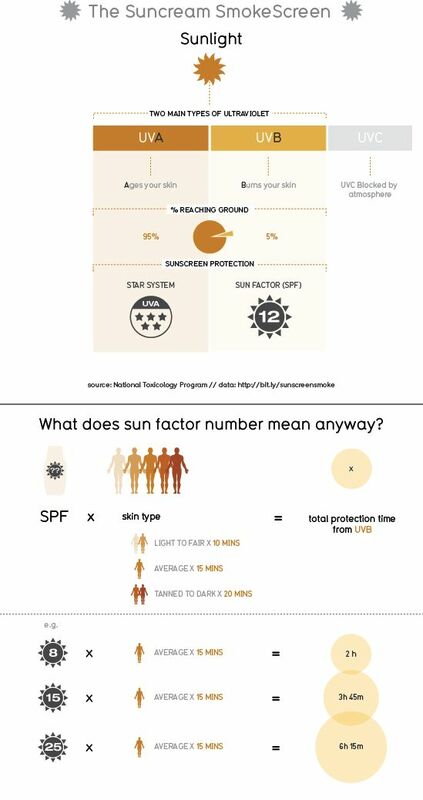 It's definitely worth taking a look so you know what type of sunscreen to buy, how much to use, when to put it on, and what you're trying to avoid by using it ... least of which are those tan lines you worked so hard to get. Riders have long sought out how to train better. With a lot of work going into workouts, the focus is also turning more and more to the recovery necessary. The demands of professionals riding the Tour de France are about high you could imagine and recovery during the event is a key determinant of success over the three weeks of the race. Cyclingnews.com has an excellent article covering Mark Renshaw and his recovery routine for between stages. It's a good insight into professional racing, the importance of recovery, and multitude of details that are covered to help athletes perform at their peak over the course of the race. It's a balance of sleep, diet, massage, clothing, rest, media and fan obligations and much more. We all know how contentious relations are in the Middle East and in places around the world due to religious differences. People fight over land and differing beliefs, yet little seems to change. In the world of bike racing, strength training is the religious war. When the weather gets cold, coaches, trainers, and athletes head inside and start to beat their keyboards (in place of their chests), sling insults, and proclaim how strength training is the prodigal son or a false saint. I could leave you in suspense as to my position, but I won't. I sit right on the fence. First, the argument against strength training. For those of you who love strength training, you'll hate this part. For the scientists and data junkies, login to PubMed and get your search on. (1) There is a lack of research showing definitively that strength training helps with cycling performance. It's easy to cherry-pick studies that show an improvement in VO2max, increased threshold, maximal power production, etc., but they are limited, have flaws in methodology, don't show significant differences, and/or haven't been reproduced. (2) The lack of specificity in most strength training means it doesn't translate to cycling performance well. (3) It takes energy to do weight training, and that is energy that could be used to do more specific training or to recover faster. (4) Cycling is an aerobic sport. That's it. An athlete's maximal strength has little to do with cycling success. Even at peak wattage, a cyclist is producing only about 50% of his/her peak force. Increasing this wattage further is a product of improvements in the person's energy systems, not muscular strength. Wait, what was that? If you're injured you can't train? Since when!? Since I've been lying here with my herniated vertebral discs. Since I pulled a muscle in my neck. Since I tried lifting a box my wife made me move and I may have torn my biceps. Since I broke my hip after tripping over a toy on the floor. OK, I've been a little harsh on the strength training. It really doesn't help your cycling. But it can help you maintain muscle balance and be a part of good abdominal and back health. It can be part of a general strength and stretching routine that helps you get through life without injuring yourself in daily activities—or carrying your track equipment between the car and infield. And it can be a good weight bearing activity to help ensure you develop and maintain good bone density (cycling alone is great for cardiovascular health but often leads to decreased bone density if its the sole activity for a person). So where do I come down on strength training? I think it is a good off-season activity for cyclists because they need the strength and suppleness to get through everyday life so they can keep riding consistently. And for long-term bone health, cyclists need to do a weight bearing activity. But for cycling performance, ride smarter. 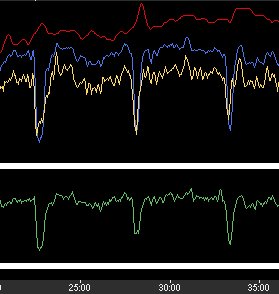 That may be better form on the bike, more hours, less hours, more intensity, improving 1 minute power, ... whatever. But you'll find the time and energy you spend on the bike will pay off more than the time and energy you spend doing strength work ... just as long as you stay healthy enough to stay on the bike. The work of an official largely goes noticed except for the start and results at a bike race. I remember officiating much of SuperWeek working 12 hours/day in temps of 90+ with about 6 hours of sleep/night by the time we'd eat and be able to get back to where the officials stayed. Sure you can find people who work more, but the point is, the time and energy of officials is often taken for granted unless something isn't correct. Not that there's anything wrong when a job well done means an event goes smoothly and event personnel become sidelights to the races. But it's good to give a shout out to officials who work long, hard days, do a great job and rarely get noticed. 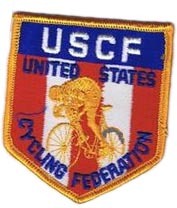 So check out the USA Cycling 2010 Officials of the Year. I know a few of these people, and they're great people as dedicated to the sport as any racer!